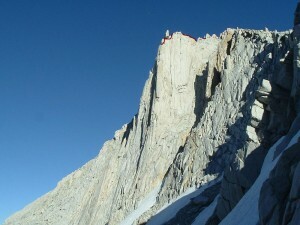 This route is considered a better quality version of Mt. Goode with similar length and aesthetics. The rock is similar to Keeler Needle: great cracks on grainier rock. P3-9/10- thin fingers and seams than back left and under the double crack system. P4-8/9 awesome hands to chimney no particualrily wide gear neeeded. This double crack system is obvious from the base. P7-10b/c up steep hands to the left of an OW, continue up through a tenious layback then up a wider crack a few wide fist sized pieces help pro. p8-go around to the right then under a tower/roof feature.